In amongst the batch of vintage new old stock button down shirts I received from the USA earlier this week were two identical Hathaway white button downs from the 1960s. As well as the fact that unlike almost every other manufacturer of Brooks knock off oxford shirts, these have no placket on the front. I wasn’t sure if I liked that at first, but then I recalled that many a time in 1940s movies when actors are wearing button downs they are often placket free and double darted at the back instead of box pleats. I haven’t checked the back pleats on these yet but I do love the ‘neck fill’ tissue paper with the Hathaway stamp. C. F. Hathaway Company was a private manufacturer of shirts for men and boys, located in Waterville, Maine. 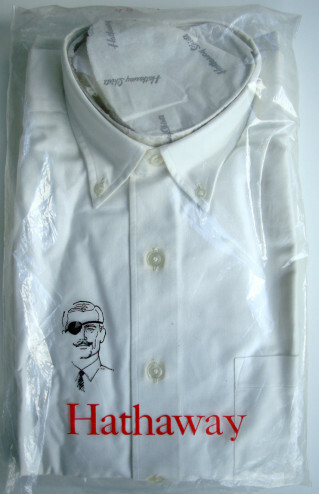 It was founded in 1837 and made uniform shirts for Union soldiers during the American Civil War. It is most famous for its “man with an eye patch” advertising campaign, which was created by Ogilvy & Mather in 1951. The man who appeared in the ad was Baron George Wrangell, who was a Russian aristocrat with 20/20 vision, but the advertisement’s creator, David Ogilvy, was inspired by a picture of Lewis Douglas, who had lost an eye in a fishing accident. Used to get mine from Simpson’s in London pre-JS. I’m also told that Austin Reed had them too back then. Better than both Van Huesen & Arrow in my book. They also made great shirts for J. Press too way back when (’80’s). I’m really liking the dead-stock shirt posts though I must admit that I am getting alarmed at the rate you’re opening ’em up. My envy rate is very high. I should post on this on the other site, but something I’ve found interesting lately when watching old shows is the variety of button-downs. I’ve seen spread-collar button-downs on Mannix and last night on Perry Mason I saw Mason wearing a golf collar button-down. Wild. That’s right Jim, I remember Austin Reed selling them and Selfridges too when they had their traditional menswear department on the ground floor front. BTW, I’ve only opened 3 of the 12 shirts so far and I’m thinking about maybe passing on some of the perma prest ones. Can’t quite bring myself to commit to that yet though. Depends I think on what the last 6 shirts are that my source has promised me before his attic is finally clear of NOS oxfords. I actually met the man who modeled for this back in the mid-late 60s while vacationing at Caneel Bay on St. John, USVI. His name was Baron George Wrangell and he claimed that the eye patch was his idea and later sued when his replacement started using the patch as well. We would hand-feed the fish together after breakfast every morning, and he would already had a drink in hand or nearby. I was 8 or 9 years old at the time., and I’ve never met another Baron or Baroness for that matter since.